20 minute meal! 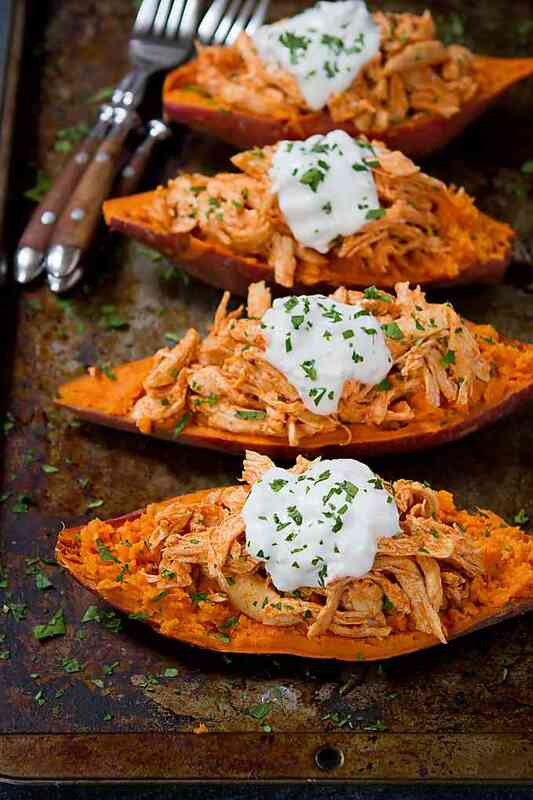 These Buffalo Chicken Stuffed Sweet Potatoes are topped with a light blue cheese yogurt sauce. 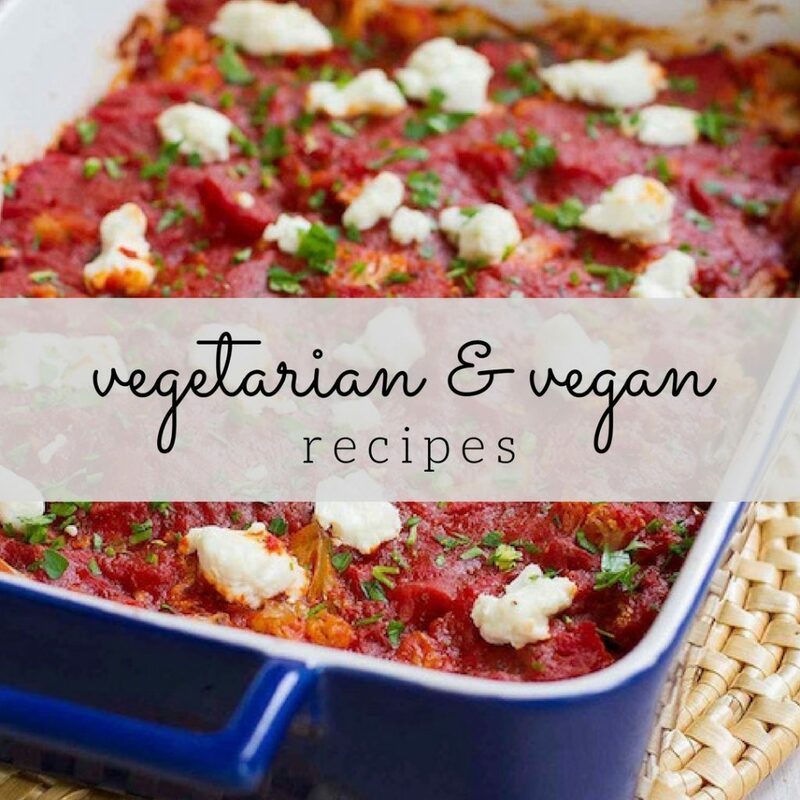 An easy weeknight dinner recipe! I have a few friends that are queens of weeknight dinner prep. They wield their knives like pros, putting slow cookers and Instant Pots to use at least a few times per week. And then there is another group of friends who are killing it in other areas of their lives, but just can’t get on top of their weeknight dinner game. And me? I fall smack dab in the middle of the two…meal planning aficionado one week and a hot mess the next. 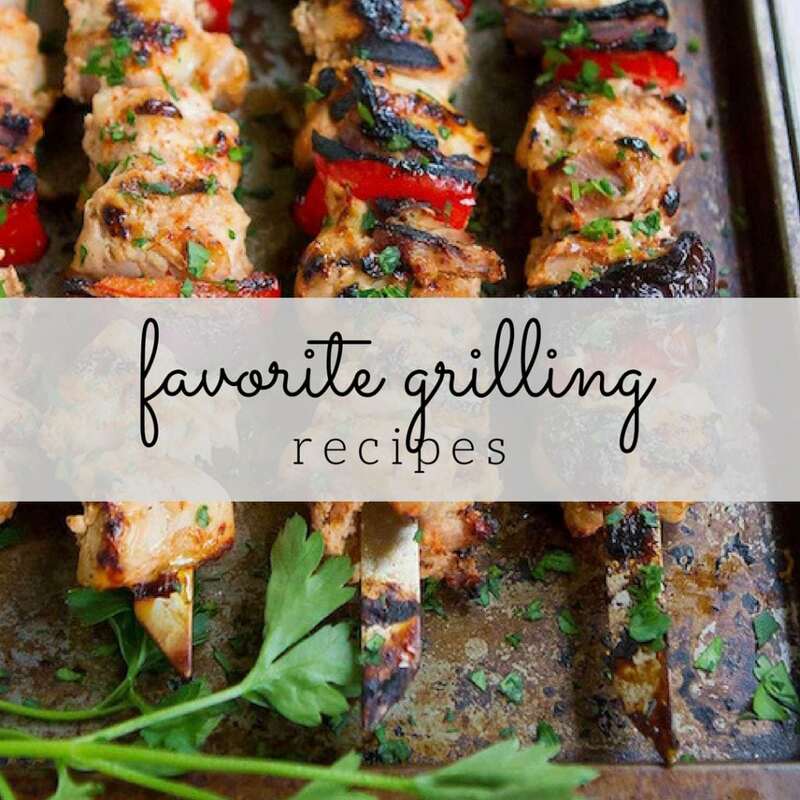 What I hear over and over again from friends and readers, and is clear when you guys pin the heck out of any quick meal idea that I post (thank you! ), is that you covet a great, healthy 20-minute meal. I’m right there with you! These Buffalo Chicken Stuffed Sweet Potatoes were inspired by my Turkey Taco Stuffed Sweet Potatoes, one of the most popular recipes on my site. And maybe a little bit of inspiration comes from the fact that it’s 98 degrees today. In Seattle. In September. And I’m ready for jeans and sweater weather, and all-things-squash-and-pumpkin. One of the reasons this recipe comes together so quickly is because it calls for cooked chicken breasts. This is where poaching several chicken breasts on Sunday to use during the week comes in handy. Alternatively, store-bought rotisserie chickens will do the trick. 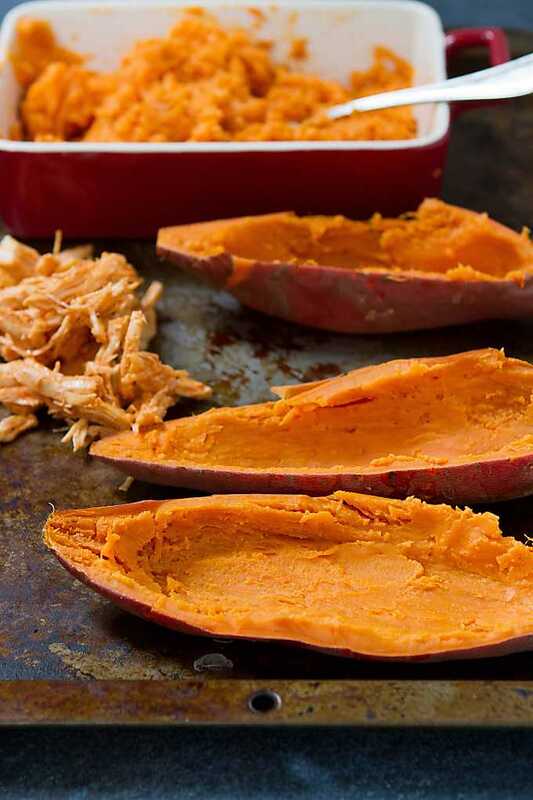 To save time, cook the sweet potatoes in the microwave. Once they’re cool enough to handle, scoop out the potato and mash it with some olive oil and the same spice mix that you’ll toss with the shredded chicken (paprika, garlic powder and salt…that’s it) before scooping back into the sweet potato skins. 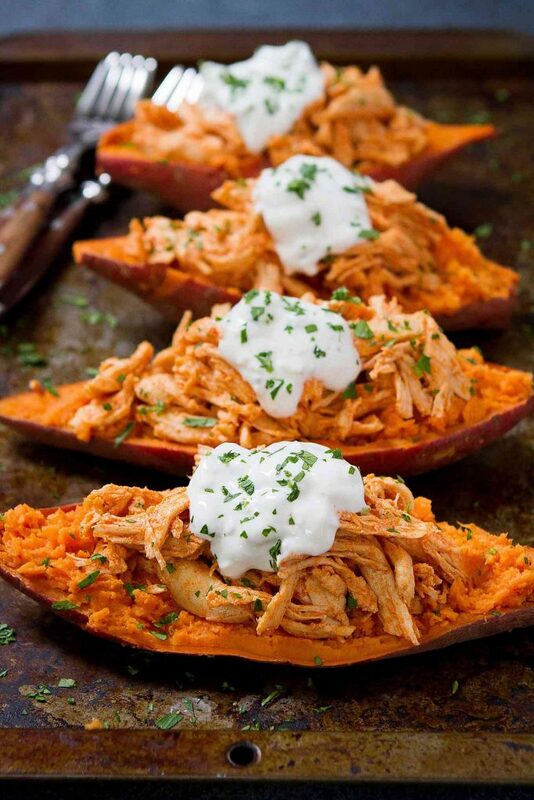 The shredded chicken is also coated with a Buffalo chicken sauce (I use this one), then piled onto the stuffed sweet potatoes with a healthy dollop of blue cheese yogurt sauce. 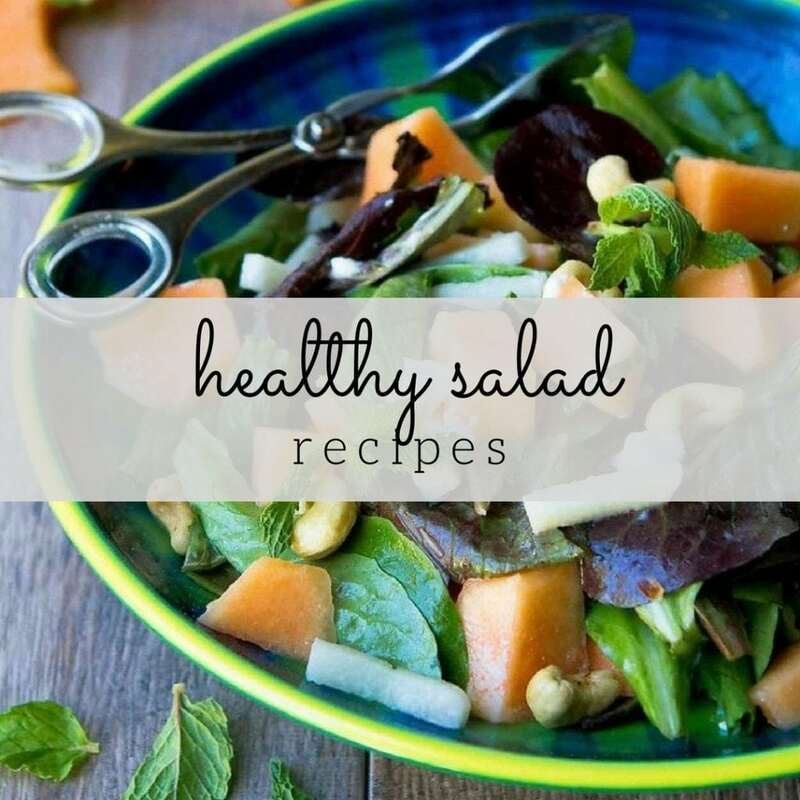 Serve it up with a side salad or steamed veggies. Pierce the sweet potatoes all over with a fork. Cook in the microwave on HIGH until tender when pierced with a fork, about 4 minutes per side. Let the potatoes rest until cool enough to handle. Cut the potatoes in half lengthwise. Carefully scoop the flesh out of the potatoes and place in a medium-sized bowl. Reserve the skins. With the back of a fork, mash the potato flesh until most lumps are gone. Stir in 1 teaspoon olive oil. In a small bowl, stir together the paprika, garlic powder and salt. Stir half of the mixture into the mashed potato. Divide the mashed sweet potato evenly between the potato skins. In a medium bowl, toss the shredded chicken with the remaining spice mixture, then stir in the hot sauce until the chicken is coated. Divide the chicken mixture evenly between the stuffed sweet potatoes. Top each with a dollop of the yogurt sauce. In a small bowl, stir together the yogurt, milk, blue cheese and salt. We had these for dinner last night. That won’t be the last time! They were really easy to make and SO good. I went the rotisserie chicken route, which made things super simple. Fair enough. Each to his own, Mason. I hope it turns out well for you. Thanks for the idea !! I’m so glad to hear that! That extra crunch of celery is always a good thing. We made this tonight, it was quick and amazing! I’m so glad to hear that, Ginger!